March is here and that means April is around the corner – and with it comes your responsibility to fill up your tax returns. Read further how and if it even applies to you in the first place. Please note: The article explains the procedure for employees only. A different procedure applies to self-employed or other sources of income. Is the annual tax reconciliation done by an employer? Your salary has been taxed by 15% each month, calculated from the super-gross salary (ie. 134% of your gross salary), on a pay-as-you-go basis and your employer already has reduced your monthly taxes for up to 2.070,- as per taxpayer. This, and for children, is the only automatic tax relief the employer can regularly claim for employees. Any other tax claims have to be done after the end of the year in a form of annual tax reconciliation. In most cases, the annual tax reconciliation is done by your employer. Your payroll department should contact you and ask if you want your employer to do the accounting for you. In such case, they should take into account any applicable tax allowances from the tax base (paid charity gifts, mortgage interests, private pension savings, life insurance, union fees) and tax reliefs (tax relief for a taxpayer even for months he or she did not work in the CR; for a spouse at home; children; kindergarten; studies; disability). an employee who received over 1,438,992 CZK of gross salary in a year and thus paid “solidarity tax“. 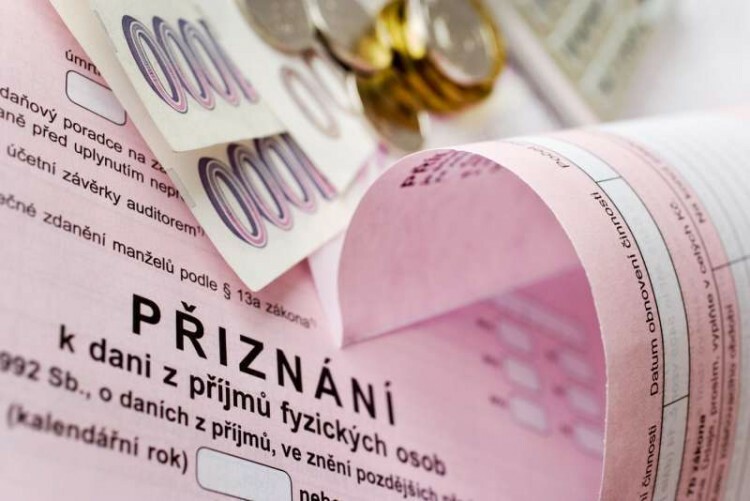 (A solidarity tax is applied to a monthly gross salary higher than CZK 119,916. Such taxpayers pay additional 7% – on top of flat 15% – of the amount exceeding the monthly limit, but if the limit for the full year has not been exceeded, they got the solidarity tax back. How to file an individual tax return form? In case you have to (as per the previous paragraph) or want to file an individual tax return forms, you can apply the same personal tax reductions: tax relief for children, spouse, study and reduction of tax base for allowances such as charity donations, interests from mortgage, pension and life insurance contributions and others. The time for the individual income tax return submission expires at the end of March. The latest submission date is April 1st. It is necessary to submit the tax return on a valid form. Although only forms in the Czech language are accepted, you can see and compare the English translation of the income tax return form and the instructions for ﬁlling out the income-tax form. Download any personal income tax forms here. A tax return can be submitted at whatever office of the Financial Authority without any respect to your local affiliation. You can, of course, file all the forms on your own, however, more frequently you would need a help of a professional accountant or a tax advisor to evaluate your situation, your possible gains and help you to file all the forms and supplement those with necessary attachments and documentation. We, at the Brno Expat Centre, cannot do the administration for you. We can only suggest you English speaking tax consultants. What are all the possible tax reductions? *The benefits with an asterisk can only be applied to a Czech tax resident or non-resident (EU citizen) having more than 90% of his worldwide incomes from the Czech sources. To apply some of the tax allowances and tax reliefs, you need to prove that you are a Czech tax resident. In an individual tax return, in an individual’s responsibility, you can just claim this and support your claim with some documents (accommodation and employment contracts etc.). However, when your employer does the annual reconciliation for you and takes the responsibility, they may ask you to bring an official confirmation about your tax residence in the Czech Republic. Such document, called Czech tax domicile, is issued by the Financial office upon reviewing your personal situation, your documentation about your stay in the CR, and sometimes interviewing you. The tax domicile is issued usually within a couple of weeks and the Brno Expat Centre can you help you with that. Please download and read detailed guideline we have provided: How to get the Czech Tax Domicile. Many taxpayers make a common mistake in determining their tax residency according to the length of their stay (183 days) in the country. The definition is included in a local and also in most foreign income tax laws. The majority of foreigners living in the Czech Republic come from the so-called “contractual countries” which means that the Czech Republic concluded with their country of origin a Treaty for the avoidance of double taxation (Double Taxation Treaty) with a higher force than local laws. Article 4 in each of the treaties defines a tax residency in four descending steps and in a quite different way than local laws. According to the conventions, you become a tax resident in a country 1) where you have your own or rented flat 2) where your personal and economic relations (center of vital interests) are, 3) where you usually stay, 4) of which you are a citizen, or 5) where competent authorities come to such an agreement. The determination of tax residency is often a complicated task for tax advisors let alone for normal people. If your employer has not helped you with the matter, you can visit a professional. Anyone who is not sure about their tax obligations can hire a professional registered tax advisor. This can bring at least two advantages. The deadline will be prolonged for 3 months until the end of June which gives you additional time to organize all necessary documents. And second, the tax advisor assumes full responsibility for the tax return and takes care of possible follow-up negotiations with the Tax Authorities. This article has been written in cooperation with a registered tax consultant Michael Hájek from Bell Consulting.